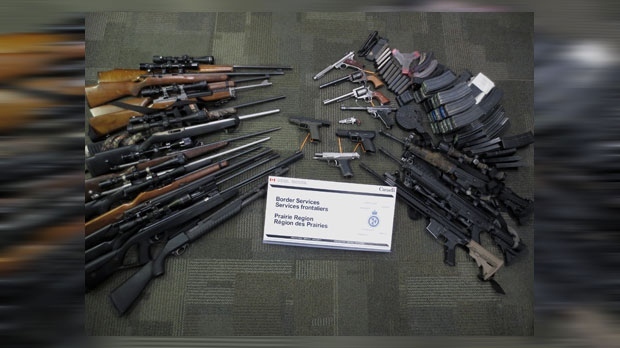 Two residents of the United States face criminal charges after officers discovered two dozen undeclared firearms, including four prohibited firearms, during a search conducted at the Coutts border crossing earlier this month. According to Canada Border Services Agency (CBSA) officials, two Americans approached the border crossing on April 9, 2018 with each driving an SUV with an attached trailer. Border agents determined the two were travelling together and destined for Alaska. A search of the SUVs and trailers resulted in the seizure of 16 long guns, eight handguns and 70 overcapacity magazines that had not been declared. As a result of the search, the two visitors from America were charged with eight criminal code and seven customs act offences on April 17. Christopher Douglas Gies, 41, and Caroline Elizabeth Gies, 42, are scheduled to make their next court appearance on June 4, 2018 in Lethbridge Provincial Court in connection with the undeclared firearms. The CBSA has not disclosed the Gies’ hometown.